Until recently, the Progressive Field food menu hadn’t been populated with local icons. But as of 2015 the Indians started to recognize the city’s best food purveyors in the Right Field District…and the Indians game experience is much better for it. 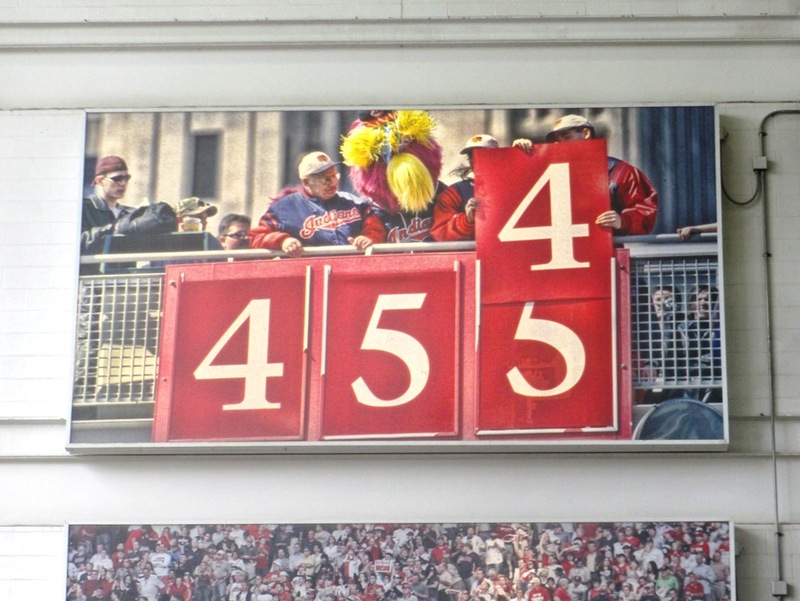 They’ve since added even more local icons to the ballpark…you can read about them here. Add an egg and it would be a pretty mean breakfast too. Progressive Field Food Tip #1: Melt Chorizo and Potato Grilled Cheese. Come on man. 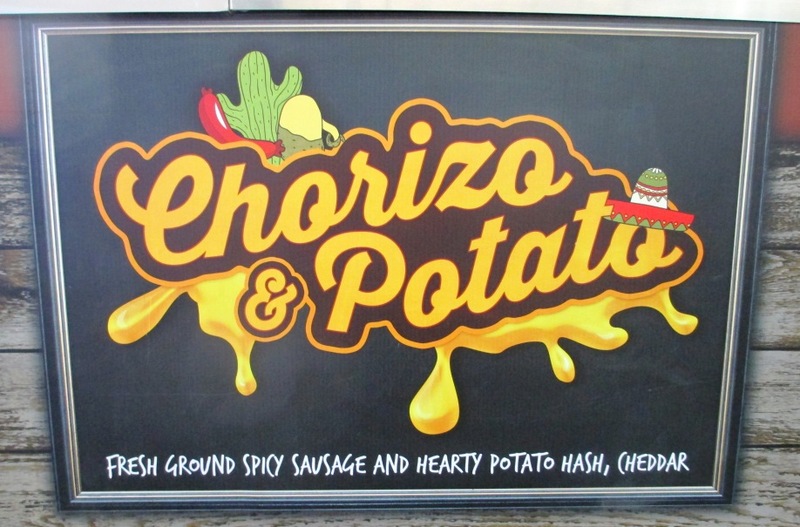 Chorizo sausage with potato hash and cheddar cheese in a sandwich! Man food, but of course women love it too. The Melt stand in the Right Field District is based on the local chain of grilled cheese sandwich shops in Cleveland, and they’re popular not just because of those wacky ingredients but also for that thick garlicky bread they pile them on. The Cleveland Plain Dealer pronounced Melt as a place where “you don’t go to watch your calories”. Bonus at the ballpark: you’ll be walking them off anyway, so go ahead and have a Melt grilled cheese. I think J.J. would approve. Progressive Field Food Tip #2: Dynomite Burger. Yes, it’s named for Jimmie Walker’s signature phrase on the TV show “Good Times”, and yes, you’re dating yourself if you’re familiar with it. But it’s not a bad exclamation for a fresh burger in any of several styles…like the “Parallax” (white cheddar, bacon, BBQ mayo and red onion), or the “Chinato” (Mortadella, tomato, red onions and tomato mayo). There are other places to get a perfectly adequate burger here, but this is the high end stuff. Look at those toppings. Dynomite Burgers are a creation of chef Zack Bruell, who by day is a chef for five fine dining restaurants in Cleveland. And yes, it was his idea to use Jimmie Walker’s catchphrase. They always get me with the peppers and onions! 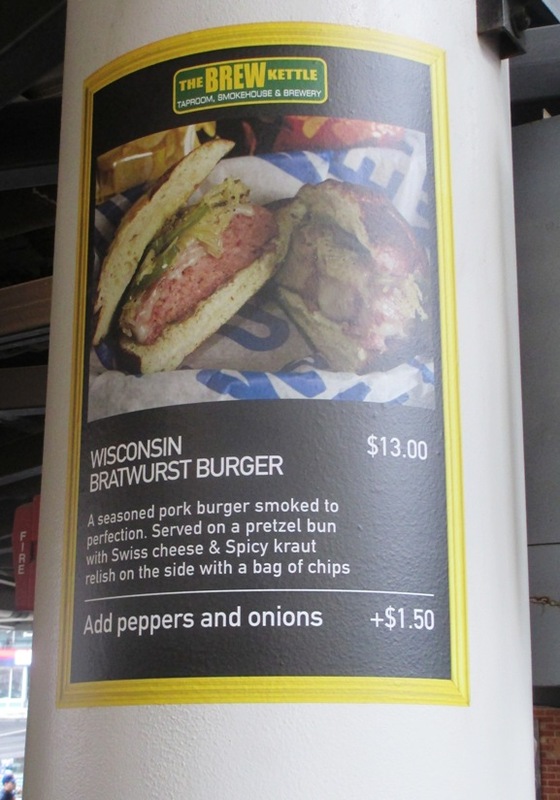 Progressive Field Food Tip #3: The Brew Kettle Wisconsin Brat Burger. Picture this: a smoked pork burger patty, topped with Swiss cheese and sauerkraut relish on the side, on a pretzel bun. With peppers and onions for a small fee, as you can see. 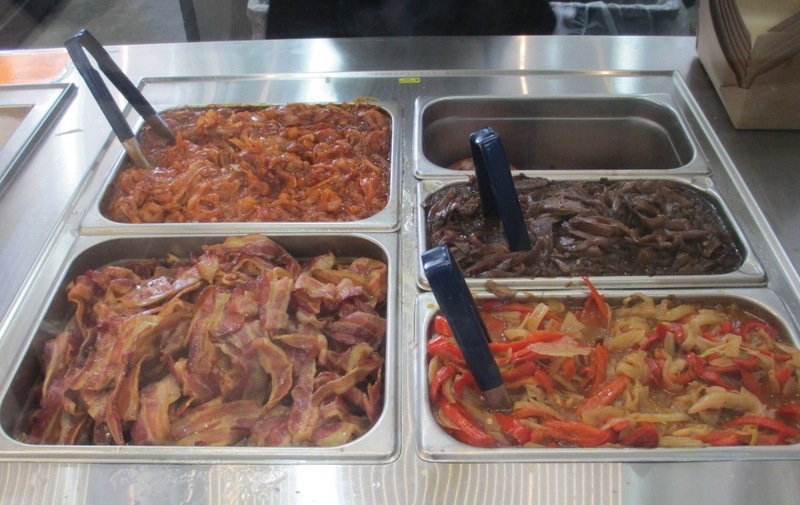 Did I not tell you Cleveland’s ballpark has a banging food selection? The Brew Kettle is a brewery with several locations in the area…and they offer some of their signature beers at the Prog, like their White Rajah IPA, the Four C’s with four types of hops, and Kitka, a coconut chocolate milk stout. Get your sausage, pretzel, beer and chocolate fix in just one place!